Macarons are to Paris what cupcakes are to New York – available anywhere, in any flavor combination. You can get them in any patisserie, but it is the Houses of Macaron that you really want to look for. Think Dior and Chanel for cookies. 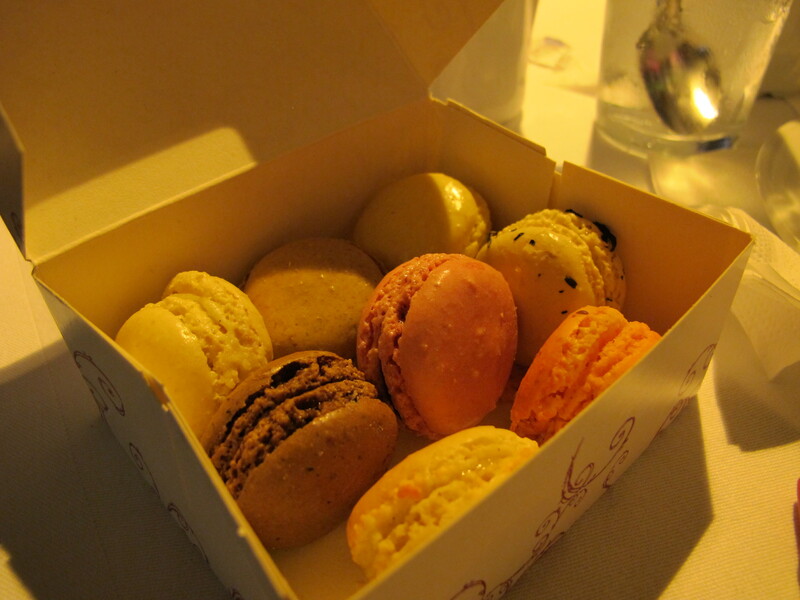 I tried three big names, in the following order: Dalloyau, Laduree, and Pierre Herme. Dalloyau is a French “house of gastronomy” with roots in the court of Versailles. While more famous for Opera cake (their invention) they’re no slouch with macaroons. My favorite was the The Bergamote flavor, which tasted like sweet Earl Grey tea. These macarons are on the small side, almost bite size. 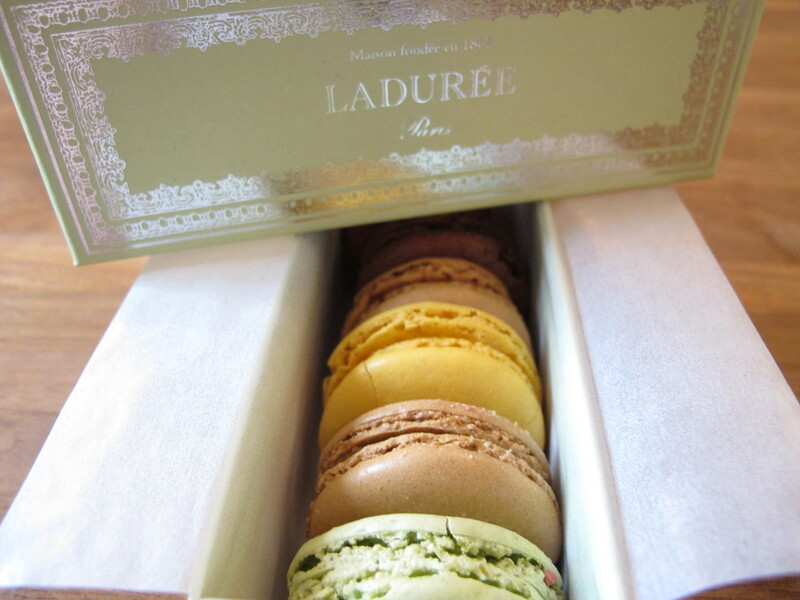 Laduree is the Grand Dame, founded in 1862, the inventor of the “double-decker” macaron. Their shops have highly regarded tea salons and their calling card is an ornate green box. I visited two locations: an outpost at Versailles which seemed to be more of a front for their growing merchandise (hello kitty/Laduree stickers, candles, bath lotions, etc.) and a salon on Rue Bonaparte. However good I thought the Dalloyau macarons were, Laduree was on a different plane. The salted caramel filling oozed from between the cookies. The strawberry was held together with a circle of jam. The pistachio had a nutty, smooth, butter cream. 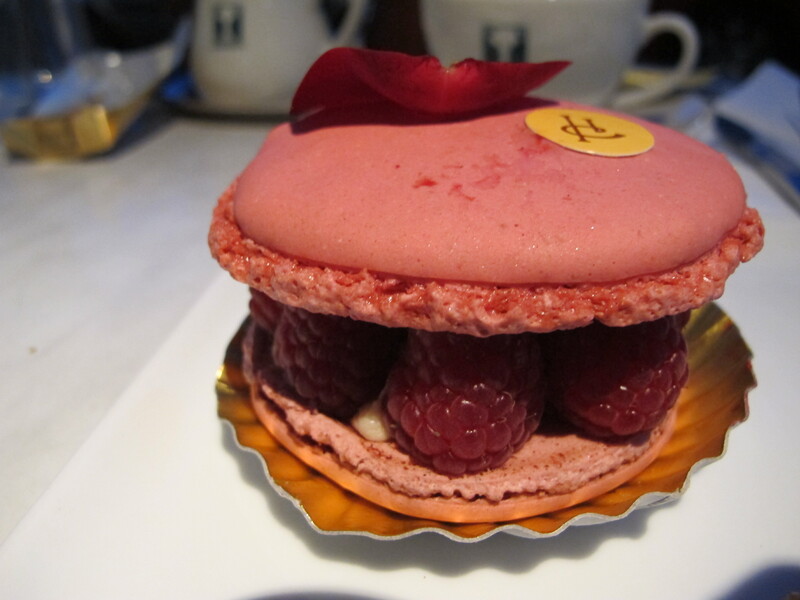 The last was Pierre Herme, Laduree’s rival. Every food blogger’s favorite Paris showdown is between these two, a match created when Herme himself left Laduree to start his own shop in 1998. Urban legend says he was annoyed by the shift in focus from pastry to merchandise, and wanted to work solely on the food. Considering he was named France’s Pastry Chef of the Year, I’d say he’s done quite well. His macarons have more filling and flair than those at Laduree, robust teenage boys to the old guard’s ladies who lunch. Whose were the best? Let’s just say my heart belongs to Laduree, despite their slightly stuffy reputation. Their perfect, petite cookies were delicious, and the silver swirls on the box that now holds my ticket stubs and wine corks just says Paris to me.